ET wrote: Meanwhile, here in Memphis, a few weeks ago a little hometown corporation by the name of FedEx announced they would invest $1,000,000,000 - that's "billion" with a "b" - in their facilities here. Some pay actions were also announced. I'm guessing all this "fails the Jesus test". Employing more people, increasing the pay of others, generating economic activity. Are you claiming this is due to the Trump/GOP tax cuts?? Truth is it is because Fed Ex has the opportunity (and is smartly - I think- betting on exploiting that) to deliver more packages due to changes in how we shop - online. I am claiming that any given corporation that will have it's profits taxed at 21% instead of 35% has a lot more money to work with for whatever business goals they have. I have little doubt that FedEx and any other U.S. corporation that have announced various spending plans have done so because they expect to have greater income due to reduced taxes. Some actions may be new and due solely to tax rate changes, others may be accelerated and brought forward because a greater cash flow will exist. If some of these companies repatriate overseas income, then we can have a discussion of whether taxing actual money at 21% is better than taxing no money at 35%. Supposedly the Tax Cuts and Jobs Act did away with loopholes that allow such low taxes being paid. Truth is very few tax loopholes were close and those that were politically motivated (e.g tax deductions for state/local taxes which was aimed to punish people from high tax states like CA , NJ and NY who voted against the GOP). And many more loopholes were created. Read it. Sure I get your point about some honest companies that do not already employ tax evasion tactics torch 21% taxes or lower will have more cash for investments. 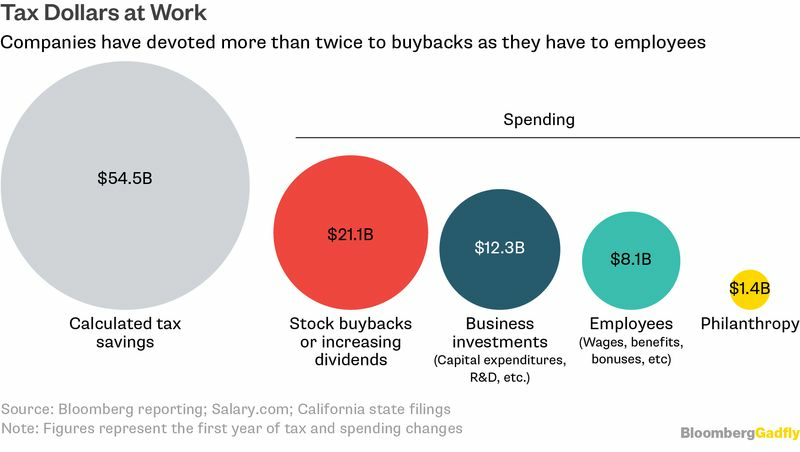 Even there, most are not investing but doing stock buybacks and bonuses to big shots. But if you think this will stimulate the economy, you have a long way to go to demonstrate that to me. Time will tell how stimulating these tax cuts will be. Last edited by ET on Wed May 16, 2018 12:08 pm, edited 1 time in total. I was working on this one when the site crashed a couple of weeks ago, so I'll go ahead and post it. For 2015-2017, the effective tax rate is listed as as 35.5%, 33.6% and 34.6% on Form 10-K of the link provided in the article (see table about three-quarters of the way down the page). Checking the annual reports of two other large corporations in my community - Autozone and International Paper - I find that the reports specify effective tax rates in a similar range. IP had effective tax rates of 14%, 37% and 26% for 2014-2016. Autozone had effective tax rates of 32.1%. 31.2% and 31.3% for 2014-2016. The annual reports for all three corporations are available on their respective web sites and are available for reference if needed. Fact, corporate tax cuts have never successfully stimulated the economy, and aren't doing so now. Fact, picking out companies in industries that are expanding as examples of how the tax cuts are stimulating the economy ignore the problem of loopholes and no way to justify how it is that those who earn 80% of the income now pay less than 20% of the taxes. ET wrote: I was working on this one when the site crashed a couple of weeks ago, so I'll go ahead and post it. I did find the tax rates you mentioned for FedX, IP and Autozone on a site called CSIMarket. Couldn’t find anything else in Memphis except Pfizer whose effective tax rate according to CSIMarket is 25.49% 22.2% and 13.45% in 2014-2016. The blurb from the CTJ about tax havens is typical, but read it all. Interesting they called out IP. 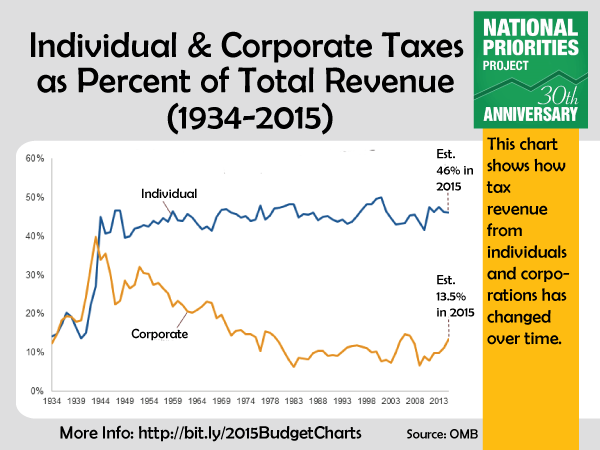 Note that corporate taxes used to be equal to individual taxes (as a percent of US revenue source); but these days individuals pay 3 times as much. This drop from 35% (nominal) to 21% in the GOP/Trump Tax Cuts will reduce this further. Where are these corporate tax savings going? 15% to employees wages/bonuses/benefits (most of that to the bosses who decide these things, I would guess), 39% to stockholders. * ET loves to point out that 47% of Americans pay no income taxes. Not strictly true, btw, since the 47% includes students and unemployed/retired - only 28% of those who earn money (mostly min wage or non-livable wages) pay no income taxes and they do pay payroll taxes, sales taxes, local taxes (usually), property taxes (If they have any). That lack of income tax is due largely to the Earned Income Tax Credit (a program suggested by Milton Friedman and enacted by Ford and extended by Reagan) as a means to curtail welfare programs (why take money in taxes just to give money back in welfare - reasonable). Consider, ET, that you did not include corporate credits in calculating effective corporate tax rates (perhaps unintentionally), while claiming foul for tax credits that allow the working poor to lower their taxes. 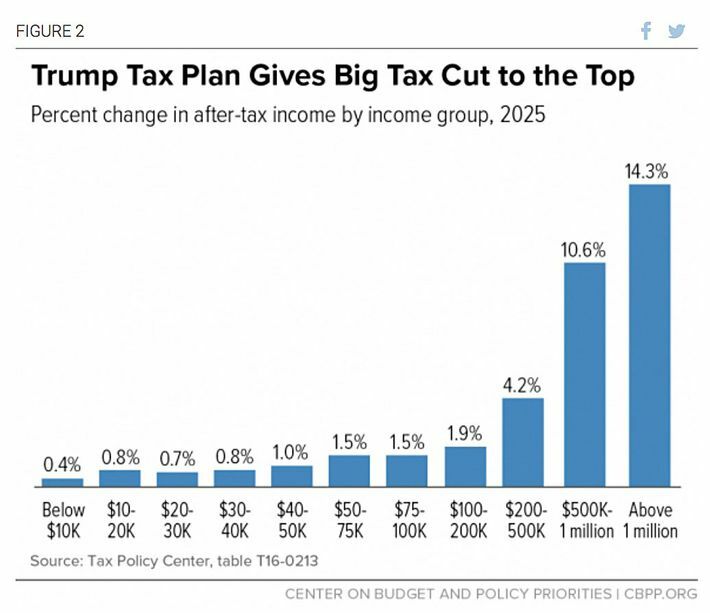 Recalibrate your tax ideas ET, remembering the very substantial point illustrated in the chart below about the distribution of the GOP/Trump Tax Cut and Jobs Program represents the near future (more inequality than even the extreme situation that we have today). Note that since the 28% pay no income taxes, those three left most bars in the chart above goes to 0% tax break. Also note that for the $30-40K bracket (that 4th bar), that represents $280/year, while the bar at the right represents at least a $143,000/year tax cut (>510:1 ratio). How in the heck can the GOP champion this as a “Middle Class” tax cut? Is anyone still reading these facts?